Campfires are not permitted at this park due to lack of firefighting equipment available on the island. Bring a portable stove for cooking. The trail leading east to Pandora Hill crosses private property and is closed to the public. Please respect the trail closure. This park is open for day-use activities and overnight camping in the designated camping area. Please be advised that all dogs and domestic pets are not allowed anywhere within Discovery Island Provincial Park – violators may be subject to fines or penalties. You can help BC Parks by following our important wolf safety guidelines before visiting the park. Park Rangers and Conservation Officers will be patrolling the area to facilitate public education and monitoring. Discovery Island Marine Park is a popular kayaking and camping destination for visitors, local residents and school groups. The park features a large open field, southwest of Pandora Hill, where campers can set up a tent. The only facilities provided are a pit toilet, information shelter, self-registration box for camping fees, two racoon caches and picnic tables. Campfires and domestic animals are not permitted in the park at any time. The park is accessible from Victoria, where paddlers can launch from Cattle Point, just north of the Oak Bay Marina. Kayakers paddling between Oak Bay and Discovery Island will be delighted by the wildlife along this route, which features a sensitive seabird nesting area and ecological reserve. Sightings of seals, sea lions, otters and bald eagles are common around the park. Paddlers should be aware that these waters can be treacherous, as strong currents and frequent winds create dangerous conditions, including rip tides. Crossings are best made at slack tide in calm weather. Boaters should be aware that there is no safe anchorage and no moorage in the park - the closest safe harbour is in Oak Bay. Mariners should exercise extreme caution, as the main access to the park is via the rock and reef-strewn Rudlin Bay, which is exposed to the elements from the Strait of Juan de Fuca and Haro Strait. Pets (dogs, cats, etc.) are not permitted in the park. Use of food caches for all foodstuffs and fragrant items while camping is mandatory. Campfires and domestic animals are not permitted in the park at any time. There is private land and federal land to the northeast of Discovery Island Marine Park on Discovery Island. Please respect these areas. The boundaries are marked or enclosed to deter trespassing. The northern portion of Discovery Island, Chatham Island and some of the smaller islands nearby are First Nations Reserve lands. They are closed to the public and trespassing is not permitted. 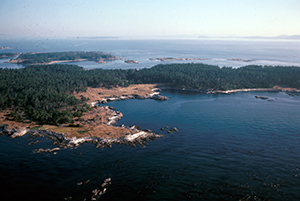 Several of the nearby islands constitute parts of the Oak Bay Island’s Ecological Reserve. These habitats are extremely sensitive to human disturbance and vulnerable to the introduction of non-native animal or plant species. Please do not enter into these areas. There is no vehicle access to this park. Access is by water only. Sensitive meadows areas. Stay on designated trails and camp only in the designated camping area. Discovery Island Marine Provincial Park is located two nautical miles east of Victoria on southern Vancouver Island. Access to the park is by boat only; the nearest boat launch is located at Cattle Point in Oak Bay, Victoria. Boaters can reference marine chart #3424, #3440 and #3461 for more information on this area. History: Discovery Island takes its name from Captain George Vancouver’s ship, the HMS Discovery. However it was the late Captain E.G. Beaumont who made the park a reality when he donated the land he lived on to the province. The property, encompassing the southern half of the island, was designated as a park in 1972. The lighthouse at Sea Bird Point on the eastern end of Discovery Island marks the junction of Haro and Juan De Fuca Straits. These two straits form the border between Canada and the United States. The lighthouse was built in 1886 and manned for 110 years before being fully automated in 1996. Sea Bird Point was named after an American paddle steamer which caught fire and was run aground in 1858 to save the lives of the crew. Cultural Heritage: The Northern portion of Discovery Island, adjacent Chatham Island and some of the smaller islands nearby are Indian Reserve lands. Please respect these areas. Conservation: The shoreline vegetation consists of grasses, native wildflowers and red and blue listed species. Beyond the fields is thick forest vegetation. These woodland and coastal bluff ecosystems represent the dry Gulf Island sub zone characterized by the Coastal Douglas fir biogeoclimatic zone. Discovery Island is accessible from Victoria by canoe or kayak. Paddlers can launch at Cattle Point in Oak Bay (Victoria). Be prepared for potentially strong currents and unpredictable weather in this area. A number of operators offer tours or rentals in Victoria. The waters around Discovery Island are home to a variety of salt water species of fish. Seasonal or year-round closures on specific species may be in place. All anglers should check the current regulations issued by Fisheries and Oceans Canada prior to fishing. Anyone fishing or angling in British Columbia must have an appropriate licence. One main trail provides a junction to reach various points in the park; head west to visit the open grass fields and rocky shoreline. Designated trails provide access to the area around the lighthouse to the east and to the open grass fields to the west of the park. Please remain within the park boundary – the area to the north of the boundary is private First Nations land and is not open to the public. This park has a day-use/picnic area within the designated camping area. This park has one pit toilet, located near the day-use and camping area. Discovery Island Marine Provincial Park has one designated camping area that offers open field camping. The camping area is located just southwest of Pandora Hill. The use of onsite food caches for all foodstuffs and fragrant items is mandatory. Please practice “Leave No Trace” camping ethics. Garbage facilities are not provided; visitors must pack out all of their garbage. Please ensure you camp and hike in designated areas. Human disturbance of the vegetation leads to erosion of the sensitive shoreline and the potential destruction of archeological sites. Fees for overnight camping apply year-round and are payable at self registration vaults, located at the information shelter or through the Backcountry Registration System. BC Parks Backcountry Registration System allows you to purchase a backcountry camping permit before leaving home. Although the system does not reserve a campsite, the system provides visitors the convenience of prepaying for their trip and not having to carry cash. We encourage all visitors to register online so we can reduce the need to collect fees in the field. Winter camping is available in this park.